Tolstoy and Dostoyevsky are considered among Russia's greatest writers, but they never could have imagined achieving such great fame as Maxim Gorky did during his lifetime. 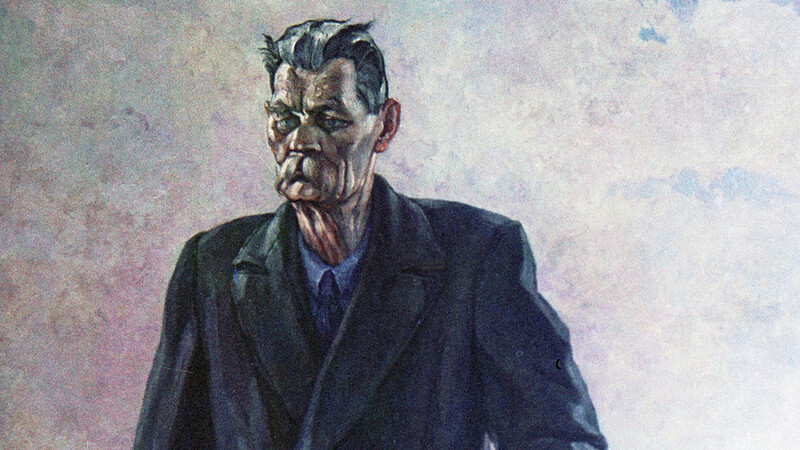 On March 28, Gorky would have turned 150, so let's take a closer look at the incredible life of this man from the common people. 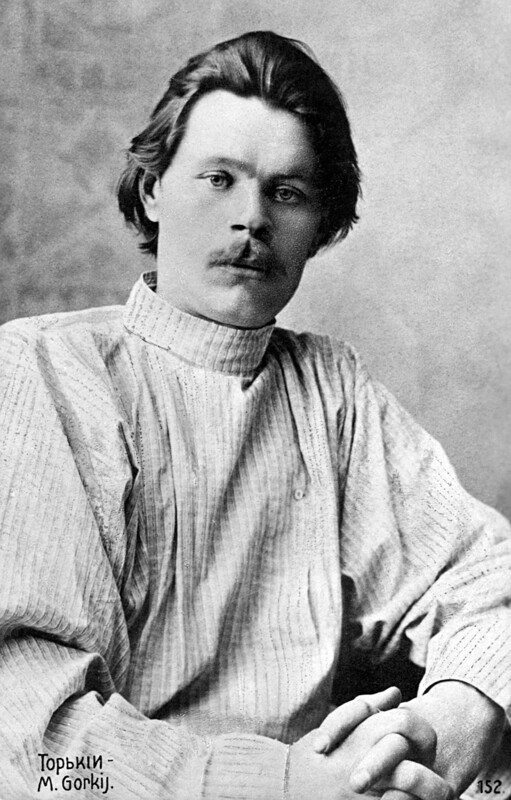 Known today as one of the most controversial authors in Russian literature, Maxim Gorky welcomed the first Russian revolution in 1905. However, he criticized the Bolshevik seizure of power in 1917, even though he was a friend of Vladimir Lenin. Gorky was a founder of Soviet literature that is tainted by the fact that many talented poets and authors, who didn’t want to write about brave Soviet workers, were not able to publish their works. Finally, he was close to Stalin, which was one reason why he didn't receive the Nobel Prize in literature. Instead, it went to Bunin. Here are five facts about the life of this semi-literate writer who arose from the lower depths of Russian society. When Alexei Peshkov (Gorky's real name) was a child, his father died from cholera. Alexei was also infected, so his mother faced many hardships and was looking for a new husband. So, Alexei was left with his grandparents in Nizhny Novgorod. When his mother died, the grandfather expelled Gorky from the house, and thus he started down his own path in life. His ‘school’ was life on the streets in cities along the Volga River where he traveled. After failing exams at Kazan University, he worked in a bakery, and then joined a revolutionary circle that read Marxist literature. He even tried to commit suicide due to depression, but then worked on a farm, where he endured backbreaking labor. Next, he set off across Russia’s south: along the Don River, the Caucasus and Crimea. He mostly walked by foot, encountering many different people, mostly strangers and beggars like himself. In his autobiographical trilogy, My Childhood, In The World, and My Universities he provides lively and bold portraits of Russian people. A short story, Chelkash, and the novel, Mother, depict poor workers, and it was these works that first brought fame to Gorky and later made him a proletarian writer, praising ordinary laborers. In 1902, Gorky published the play, The Lower Depths, which became extremely popular. Konstantin Stanislavsky immediately staged it at his Moscow Art Theater, and it was also staged in Europe. In fact, the German version was shown in Berlin 300 times in a row. Tolstoy was shocked by this success. When he first read the play he asked Gorky, “Why are you writing this”? He just couldn’t imagine that a play about a night shelter for homeless people depicting prostitutes and alcoholics could be interesting to the public. 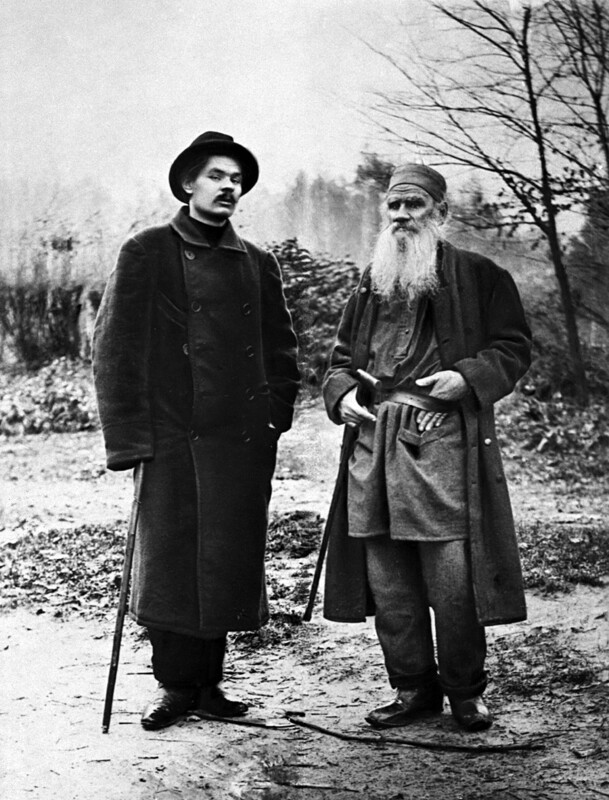 Gorky considered Tolstoy almost a god, and was strongly influenced by him. For his part, the white-bearded literary genius felt the importance of Gorky’s new prose, but he was annoyed when reading about Gorky’s unexpected successful, not to mention scandalous, tour across the United States. Read more about the difficult relations between these two extraordinary writers here. 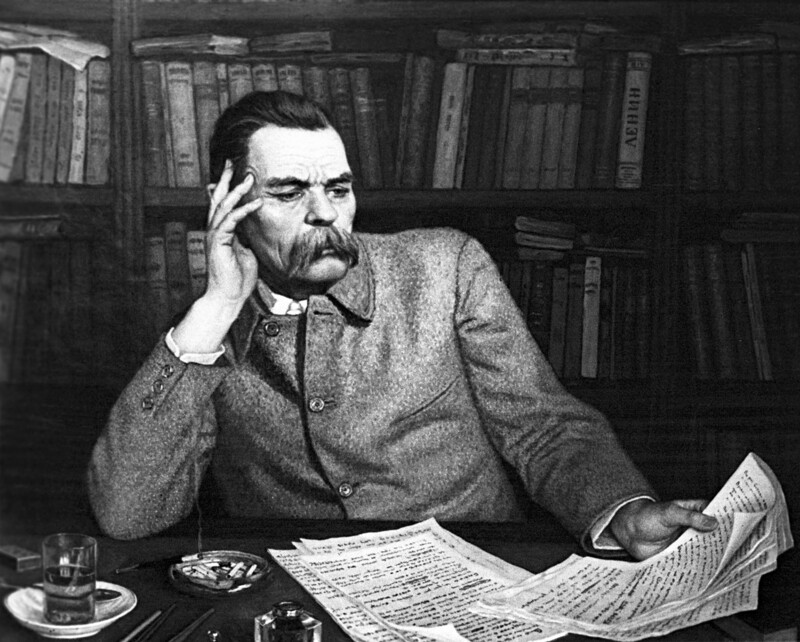 By his thirties, even though he had read such philosophers as Nietzsche and Schopenhauer, Gorky still remained semi-literate, and his wife Ekaterina had to correct his grammatical mistakes. He started working as a reporter for several newspapers, and literary magazines frequently published his short stories. Only after six years of working as a writer did Gorky become an honorary academic, something that so enraged Tsar Nicholas II that he ordered the author stripped of this honor. After the overthrow of the monarchy in 1917, Gorky once again became an academic. 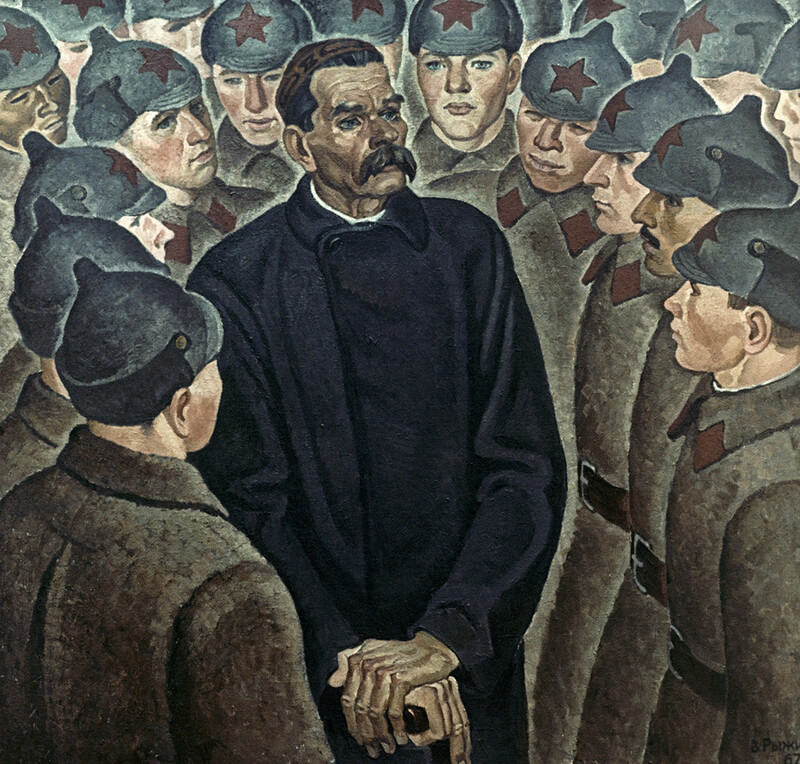 Gorky glorified the Revolution, and his “Song of the Stormy Petrel” was eagerly embraced by the revolutionary movement. Gorky was truly inspired by the 1905 Revolution, and when government troops shot into a crowd of peaceful demonstrators the author wrote a revolutionary proclamation that landed him in imprison. Still, he had misgivings about the Bolshevik seizure of power in October 1917, considering it premature. He described it as a dangerous experiment, and later captured all its horrors, blood and chaos in a series of articles entitled Untimely Thoughts. Even in the years before the Bolshevik ascent to power, when Gorky was living mostly in Europe, especially on the Italian island of Capri, he met Lenin and the two spoke for hours. While the Bolshevik leader was open to numerous intellectual talks, he absolutely couldn’t tolerate any of Gorky’s political thoughts and suggestions. In 1921, Gorky’s relations with the new Soviet state grew worse, and he asked to emigrate, but was only allowed to take short trips in order to treat his tuberculosis. After Lenin’s death, Gorky was allowed to leave the Soviet Union but he was no longer a welcomed guest in Europe and not allowed to visit Capri. He only went to Sorrento. Gorky is considered the founder of Soviet literature, when he proclaimed Socialist realism that called for aesthetics and methods of writing to serve the goal of building a socialist state. This paradigm called for characters to have a sense of morality and ideology. The writer is a propagandist, and in order to be published one had to follow the new cultural dictate. 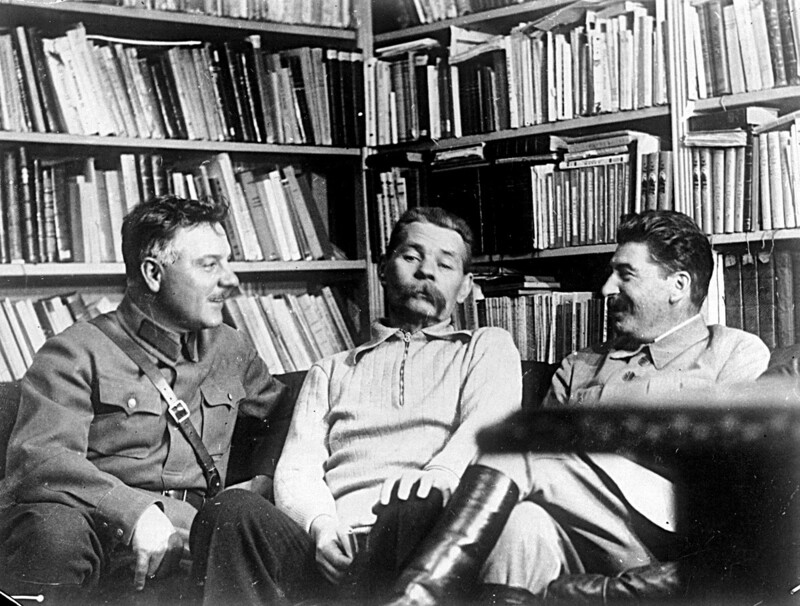 Stalin understood Gorky’s influence on the people and wanted him on his side. That’s why the Soviet state spent huge amounts of money on Gorky’s luxurious living: foreign tours and Italian villas, a mansion in the center of Moscow and even his son’s automobile hobby. At the same time, Gorky had to do some dirty jobs, whatever Stalin asked of him. Among these was a visit to the Solovki Gulag camp, which Gorky had to praise, writing that it was a great place for re-education. He even wrote an article about the construction of the White Sea–Baltic Canal that justified the enslavement of prisoners. Still, it’s not entirely clear if Gorky acted sincerely, and there were even rumors that Stalin threatened to send Gorky’s son to the camps. There is also evidence from prisoners themselves that they were made to dress all in white and take newspapers in their hands, welcoming the writer as if their life in the gulag was a resort. Some held newspapers upside down, and Gorky approached one and turned it right way up as a sign that he understood what was really going on. Nevertheless, Gorky was severely criticized by non-conformist writers, who said that he had sold out to Stalin’s regime. Despite all of this, Gorky tried to help everyone who had a relative in prison, and it was always prestigious to have the proletarian writer as a friend.